As an adult who has been eating and pooping pretty consistently over a lifetime (hopefully), you've probably noticed that some foods move through you faster than a skinny kid down a theme-park water slide, and others are more like William Howard Taft going down that same water slide. Presidential jokes aside, it's not just you; there's a scientific reason certain foods affect your bowel movements differently than others. Why do you always have the runs after a night of drinking? What did you eat that's giving you all that constipation? We asked a gastroenterologist, Dr. Kathlynn Caguiat, for her expert opinion on these pressing poop matters. Ah, glorious bread, the starch that makes grilled cheese and BLTs possible. And it can be helpful in the poop department, too... unless you have celiac disease. "Bread has low fiber and can help with loose stools or diarrhea," Dr. Caguiat says. "Eating lots of it can cause constipation. In patients who have celiac disease or gluten sensitivity this can lead to abdominal pain, bloating, diarrhea." So if you're a little runny, white bread toast might be the answer... unless you have problems with gluten, in which case it'll probably only make things worse. If you notice things feeling a little backed up after a particularly meat-heavy meal, it's not a coincidence. "Red meat tends to cause more of constipation because it is low in fiber and it has iron, which can be constipating," Dr. Caguiat explains. A burger on a white bun is basically screaming constipation, in other words. 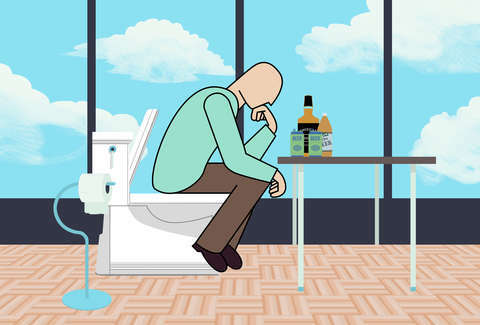 After a night of heavy drinking, you can usually expect a head-pounding hangover and frequent trips to the bathroom. 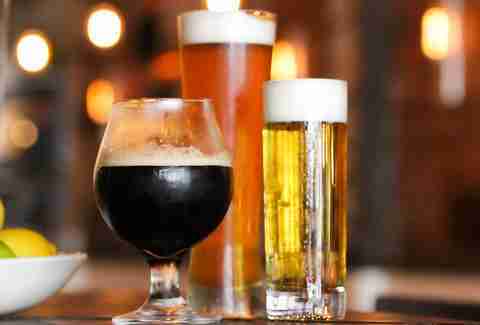 "Alcohol can increase gut motility and it doesn't get broken down before it reaches the colon, where bacteria feast on these, resulting in bloating and diarrhea," Dr. Caguiat says. For the laymen, increasing gut motility means that everything moves more, and faster, down the pipes than you're used to. Which you know, since you've likely experienced the effects firsthand. Fruit is like nature's candy, and just like unnatural candy, too much of it may lead to bathroom problems. "Fruits contain certain sugars that we don't digest, and therefore end up being digested by gut bacteria," she explains. "Again, with fermentation, gas is the byproduct, which can lead to bloating and diarrhea." Apple-and-banana farts are no good, so consume in moderation. You probably don't need a doctor to tell you that cheese -- known by some as dairy heaven, others as dairy crack -- can screw up your gut and haunt your roommates for days. If you're one of the 65% of adults who are lactose intolerant, the aftereffects can feel like coming down from a hard drug; it wreaks havoc on your GI tract. "Cheese (and dairy) contain lactose that when consumed by people with lactose intolerance can lead to bloating, gas pains/abdominal cramping, and diarrhea," Dr. Caguiat says. "This happens because the enzymes that break these sugars (lactose is a form of sugar) are lacking in susceptible people as they age. The gut bacteria end up digesting them (fermentation), leading to gas production (hence the bloating and crampy pain), and this draws water into the colon, leading to diarrhea." 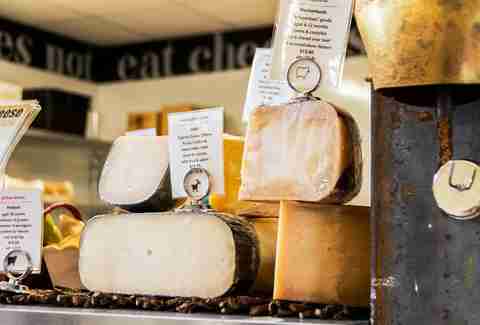 Basically, cheese turns most people into farty, bloaty, runny messes. But it's totally worth it. Yet another reason to keep eating your veggies; they help you have healthy poops. "A high-fiber diet is good for colon health as it helps bulk up the stools and draws water into the colon to help pass soft stools," Dr. Caguiat says. But there can be too much of a good thing. "Too much fiber can have the opposite effect, constipation, especially when you eat much more than you consume water," she adds. "Also beware that certain vegetables are gas-producing (cruciferous vegetables like cabbage, broccoli, etc.) so this can lead to bloating and gas pains." Aside from the lethal amount of sugar and calories and resulting spike in blood glucose levels, there's another reason to limit your intake of candy and treats. "Similar to fruits and alcohol, [sweets] tend to cause more bloating and diarrhea by the same way of fermentation," Dr. Caguiat explains. Christina Stiehl is a Health and fitness staff writer for Thrillist who is one of those 65% percent of people who shouldn't eat cheese, but never listens. Follow her @ChristinaStiehl.